Muscle and Tendon Basics: Joint motion occurs by muscle contraction. Muscles attach to bone by tendons at each end. Muscle contraction can be concentric, meaning the muscle is shortening, or eccentric, meaning contraction is occurring while the muscle is lengthening. Eccentric contraction occurs because the joint is moving in the opposite direction, even while the muscle is firing. Muscles that contract together on the same side of a joint are called agonistic meaning they are working together. Muscles on the opposite side of the joint causing it to move in the opposite direction are called antagonistic. Joint motion requires muscles working simultaneously on both sides for balanced movement. If the muscle were firing only on one side of the joint, the joint would just collapse in that direction. Muscles firing on the opposite side of the joint, even though they are lengthening, control the speed and amount of joint motion that occurs. Muscle and tendon injuries occur from an eccentric force where the muscle is attempting to contract while it is being stretched. Muscle injuries (strain) occur where the muscle joins with the tendon (myotendinous junction). Tendon injuries occur where the tendon attaches to bone. 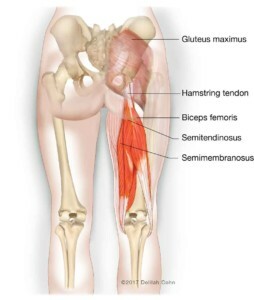 Hamstrings: The hamstrings are a group of three muscles (biceps femoris, semimembranosus, and semitendinosus) that originate from the ischium of the pelvis bone in the back of the hip (“sit bone”) and then extend down the back of the thigh, inserting on the top of the lower leg (tibia and fibula) behind the knee. They are “two-joint muscles” because they work across two joints: They extend the hip and flex the knee. (Fig 1) Hamstring injuries are common because they are exposed to more eccentric forces that simultaneously work across the hip and the knee. (Fig 2) These three muscles have various myotendinous junctions at both ends, and thus, a hamstring muscle injury can occur virtually anywhere up and down the back of the thigh. Tendon injuries most commonly occur where the three tendons attach to the ischium. Tendonitis is inflammation of the tendon that can be painful. Tendinosis means that there is some breakdown within the tendon fibers. (Fig 3) Tendon, like muscle and bone, constantly remodels in response to the forces placed upon it. This is called Wolff’s Law. If repetitive forces from activities exceed the tendon’s remodeling capacity, that is when breakdown can start to occur. With rest and physical therapy, and occasional judicious use of injections, the healing/recovery process can catch up, with resolution of the problem. Stubborn cases can turn into chronic conditions that fail to heal and may occasionally benefit from surgery. Symptoms are usually associated with activities that require vigorous firing of the hamstrings such as sports and exercise. Eventually, just sitting will become painful. On exam, tenderness is localized to where the hamstring attaches to the ischium, and pain is worsened with stretching of the hamstring and with contraction that is resisted by the examiner. (Fig 4,5,6). Acute rupture of the hamstring tendon from the ischium can occur and is usually caused by a fairly violent force. (Fig 7) Most commonly, the knee is extended and the trunk is forced forward, causing the hip to flex. This can occur by many different mechanisms, although the classic example is a waterskiing accident where the skier is trying to get up out of the water and gets pulled forward over the skis (Fig 8) These tears are typically associated with severe pain, and then bruising will usually start to rise to the surface of the skin over the next few days. Acute tears can often heal, but when all three tendons are involved or when there is significant separation from the bone, surgical repair is often preferred for individuals who wish to return to an active lifestyle.